Flashback to AfricanX, KK100, and FKT memories. No better week than a short week – less time at a desk and more time on the trails. Did you make some memories? Remember to send us action shots or letters to be featured in the next print issue. Tarrin van Niekerk was totally ecstatic about her Mafadi Peak Summit. Wishing you spectacular views, an in-tact sense of humour, and stable joints this weekend. All the best to everyone running Oyster Catcher 2 Day! In case you missed the six-page feature in TRAIL 28, discover the 10th AfricanX Trailrun presented by ASICS on our website. Sediqa Khatieb, Dr Kusekuhle Magadlela, Chantel Nienaber, and Jan Ham share their experiences from the 2018 event. Read our Facebook summary of the Karkloof100, Rhino Peak Challenge, and Cathedral Peak Challenge, which all happened in KZN last weekend. Karkloof100 have released the event film, made by the talented Phonix Capture team. You can still donate to rhino, crane, and vulture conservation via the Rhino Peak Challenge. Simply click on the PAY/DONATE button on the homepage. If you were at any of these, or other trail runs this weekend, please share a photo from the experience in our Trail Trophies thread. We’re testing three versions of Squirrel’s Nut Butter. See our short intro to this product that reduces chafing and protects your skin from dryness and unfriendly weather conditions. No squirrels were harmed in its making. WHAT DO THE WEEKS AHEAD LOOK LIKE? There are 10 September events and, 52 October events, listed in our online calendar. Highlights include Oyster Catcher 2 Day, Uitsoek Mountain Marathon, StrongmanRun, Harrismith Mountain Race, 8 Hour Challenge, the Vine to Valley Series, and the final Nissan Trailseeker in Cullinan. If you notice an event missing from our calendar, please let us and the organiser know, so they can send us the details. Listings in our print mag and website (in the last 30 days before the event) are free. Or get your event promoted for a longer period. Was this week and the pending long weekend a good trail running one for you? Let us know in the comments and images that get shared on our Facebook Trail Trophies post next Tuesday. New issue T29 out from Tuesday next week. What’s in it and find stockists. Survey – how often would you like to receive this newsletter, and do you like the more concise format? May your week bring you wonder and awe… and as always, I wish you happy trails wherever you go. How do you prepare for a 100 mile trail run? It’s a good time to revisit this article by coach Neville Beeton. TRAIL contributor Rae Trew-Browne told us this week he’s been using this programme for his preparation for Karkloof100. Two South Africans have conquered giants. Matt Dove and Anouk Baars completed the 330km Tor des Géants in Italy last week. Matt finished on Thursday, placing 45th, in 102h47min. Anouk completed the course the next day, in 127h17min as 20th woman. The top 10 men and women in the Golden Trail Series who will compete at the 10th Otter African Trail Run presented by Salomon next month have been announced. The top 10 women are: Ruth Croft (NZ), Ida Nilsson (SWE), Laura Orgue (ESP), Megan Kimmel (USA), Eli Gordon (ESP), Holly Page (GB), Sheila Aviles Caetano (ESP), Silvia Rampazzo (ITA), Fanny Bergstrom (SWE), and Meg Mackenzie from sunny SA (pictured)! The men’s top 10 are Kilian Jornet (ESP), Stian Angermund-Vik (NOR), Marc Lauenstein (SWI), Aritz Igea (ESP), Oriol Cardona (ESP), Stephan Wenk (SWI), Alexis Sevennec (FRA), Sage Canaday (USA), Thibaut Baronial (FRA) and Bartlomiej Przedwojweski (CZR). The South African trail community looks forward to welcoming this incredibly talented pool of athletes to South African shores in October. The Otter African Trail Run takes place on Saturday 20 October. Report by Bryony McCormick. The Greylings have created a mini human. Christopher Lourens Greyling entered the world on Wednesday night to meet delighted parents Landie and Christiaan. Follow the action at the Karkloof100 with their live tracking link. There are 111 runners registered and ready to run the 100 miler, starting at 8pm today. Our website has 23 events left in September, 41 in October, and five promoted events going into December. Patagonia Men’s Strider Pro Shorts – 5in. Designed and refined for the core trail runner who loves to go long, the updated five-inch Strider Pro Shorts are made of flash-drying 100% polyester woven dobby fabric with a DWR (durable water repellent) finish and a built-in odour-resistant liner. Mesh panels provide great breathability in key areas, while five easy-access pockets secure your small essentials. The Gear Guide in TRAIL 29 has 37 useful products from 24 top brands: Aonijie, Biogen, Brooks, Buff, Capestorm, Enduren Nutrition, Feetures, First Ascent, Fuelbelt, Hi-Tec, Hydro Flask, Klean Kanteen, Knog+, La Sportiva, Ledlenser, Maurten, On, Patagonia, Pekant, Rugani, run angel, Salomon, Squirrel’s Nut Butter, and Thule. Divided into four easy-to-navigate sections. Got a letter for us for issue 30 (Jan/Feb/Mar 2019)? We love hearing from you, so hit reply and tell us what’s been happening in your life. All published letter writers get a pair of high-quality Feetures socks worth R249 per pair. Visit their website. Cape Trail Clinic. 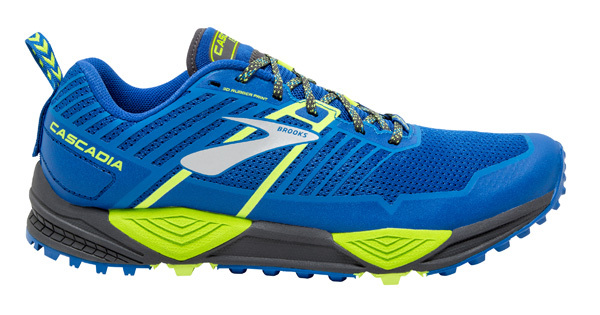 One runner at our fourth Cape Trail Clinic on 3 & 4 November will win a pair of the newly released Brooks Cascadia 13 trail shoe worth R2,399. Venue is Stellenbosch University campus, as it has been for the past two years, and it’s powered by Brooks Running and RUN Specialist Store. Entries are open, and there is a Smart rate which will save you some dosh. If you read the mag, thank you! If you would like to support our efforts in another way, how about a Facebook review? It will take just a few seconds of your time. Not in the TRAIL family yet? You’re invited to buy the magazine.